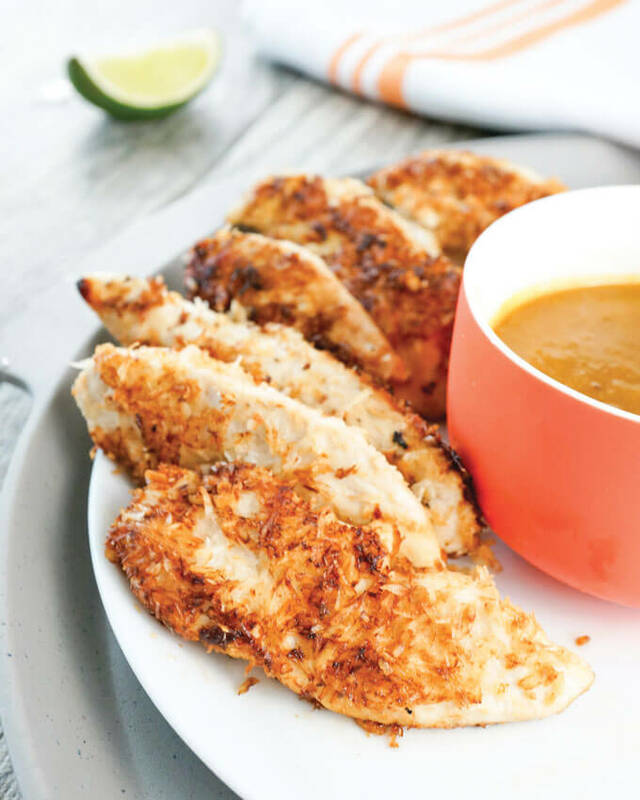 This coconut-crusted chicken tenders with pineapple dipping sauce recipe is gluten-free, paleo and AIP-friendly. This quick and easy chicken recipe from The Healing Kitchen is perfect for a weeknight dinner. 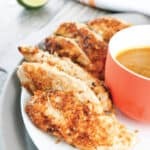 With less than 10 ingredients and a few minutes of hands on time, you'll have an AIP-friendly chicken fingers meal the whole family will love. So what is AIP? It's a variation of the paleo diet called the Autoimmune Protocol that's designed to be nutrient-dense, anti-inflammatory, and promote overall healing. This book by Alaena Haber of Grazed and Enthused and Sarah Ballantyne, The Paleo Mom, is the best introduction to AIP I've seen. The Healing Kitchen takes you through an easy-to-understand explanation of the Autoimmune Protocol. It explains why certain foods are included or excluded from the diet. 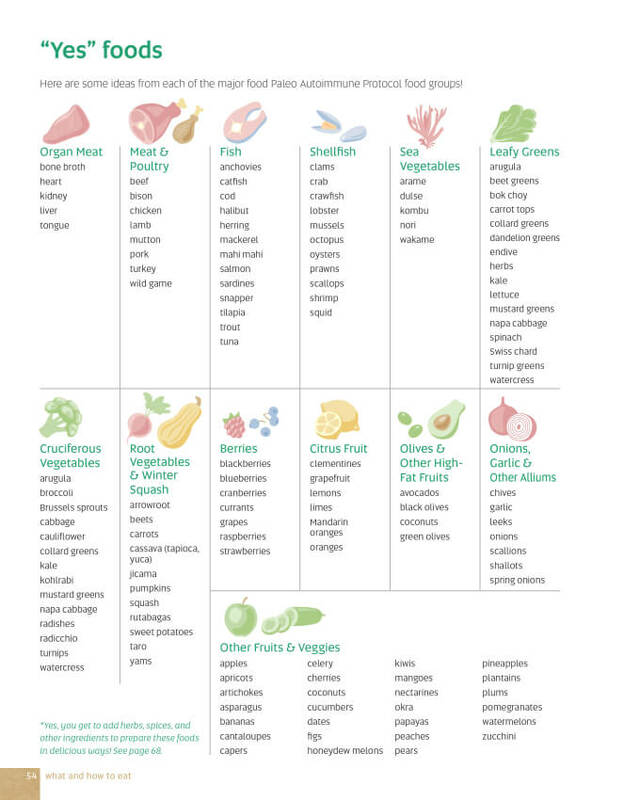 And includes visual guides and cheat sheets (like the one below) to help you remember which foods to eat, what to avoid, and how to put it all together. 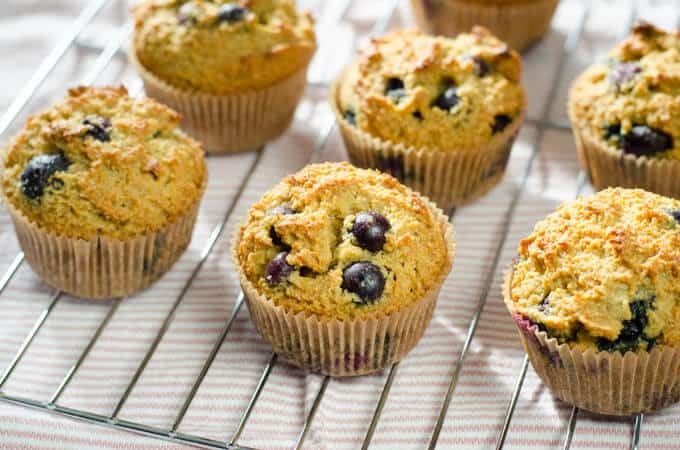 There are 12 one-week meal plans with shopping lists, and over 175 Paleo Autoimmune Protocol recipes. Everything from breakfast favorites to snacks, mains, and desserts. Along with tips on shopping on a budget and batch cooking. Look inside the book to see the full table contents and sample sections. 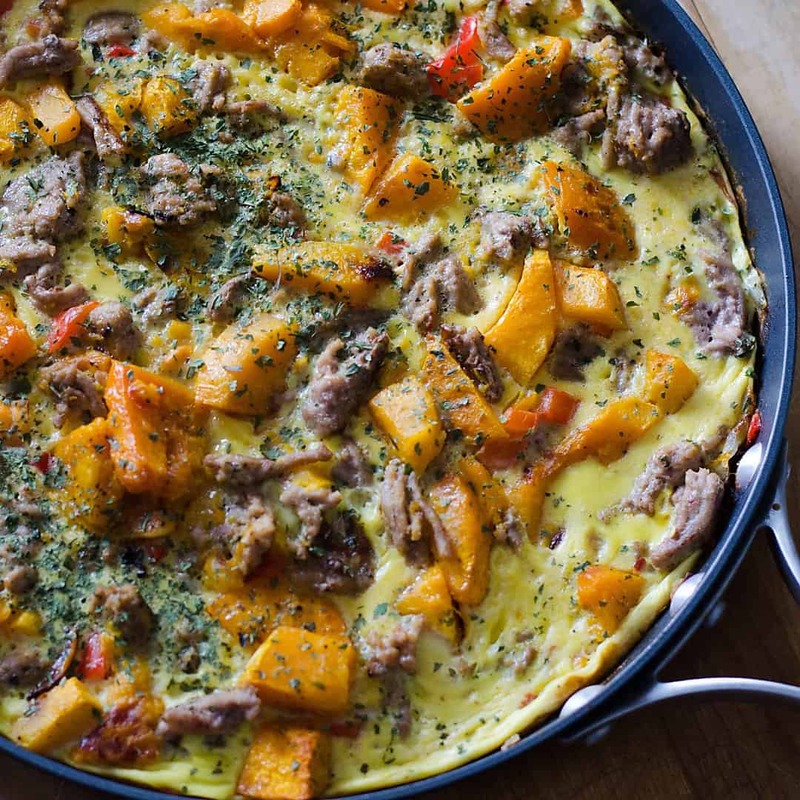 Here's a sneak-peak recipe from The Healing Kitchen: 175+ Quick & Easy Paleo Recipes to Help You Thrive. This quick and easy chicken recipe from The Healing Kitchen is perfect for a weeknight dinner. Prepare the dipping sauce: Drain the pineapple and reserve the juice. Transfer the pineapple chunks to a blender with the molasses, honey, fish sauce, and 2 tablespoons of the reserved juice, setting the rest of the juice aside for use in Step 2. 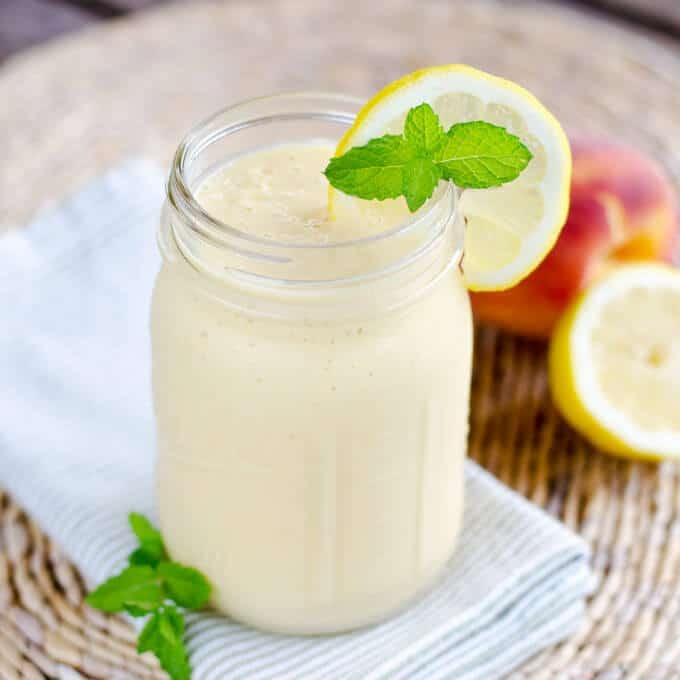 Blend on high speed until a smooth, thin sauce forms. Set this dipping sauce aside in a small serving bowl. Whisk together ⅓ cup of the remaining pineapple juice, lime juice, and salt. Marinate the chicken in the liquid in a large plastic bag in the refrigerator for 1 to 1½ hours. Remove the chicken from the marinade and place on a work surface. Spread the shredded coconut on a shallow plate. Roll each chicken tender in the coconut until coated on all sides. Heat the coconut oil in a very large skillet over medium-high heat. Ideally, you want to cook all the chicken in one batch to prevent the coconut oil from burning, but avoid crowding the pan. Fry the chicken tenders for 2 to 3 minutes per side, until cooked through. 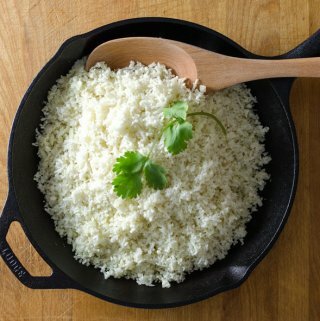 If cooking in two batches, wipe out the skillet between batches and then add additional coconut oil to the skillet. Serve the chicken tenders immediately with the pineapple dipping sauce. Make Ahead: Make the dipping sauce up to 4 days in advance and store in the refrigerator until ready to use. 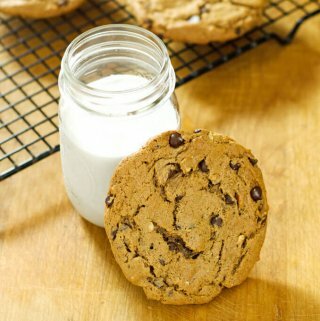 Store & Reheat: Once cool, store in a sealed glass container in the refrigerator for up to 3 days. To reheat, place the chicken tenders on a broiler rack and broil for 2 to 3 minutes, until warm and crispy. 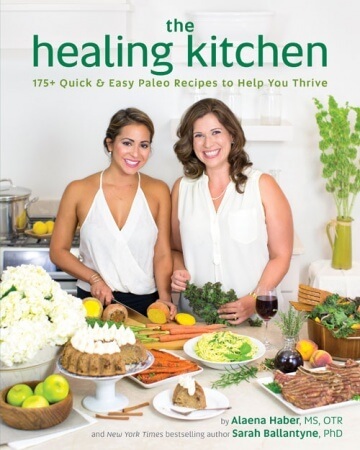 Recipe and photos reprinted with permission from The Healing Kitchen: 175+ Quick & Easy Paleo Recipes to Help You Thrive by Alaena Haber MS, OTR and Sarah Ballantyne, PhD (Victory Belt Publishing Inc.).